Verdella « Hercules and the umpire. As you know, my daughter Lisa, and her husband Karel, have just had their third child, Zora. Petra, their oldest child (5), has some understanding that Zora came from her mother’s tummy. Milan (3) is pretty clueless. A few weeks before Lisa was scheduled to give birth, Karel returned to his teaching duties. Among other things, he teaches biology. 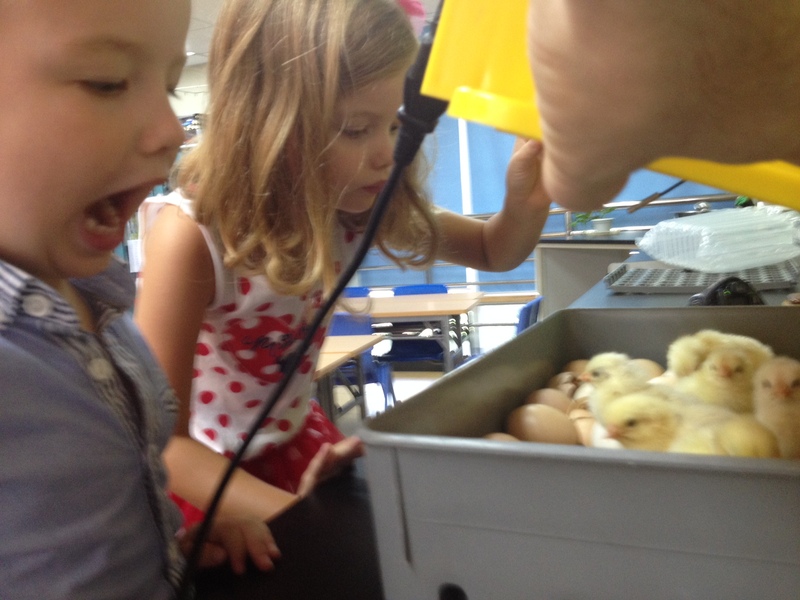 He decided that it would be a good learning experience for his students to incubate live chicken eggs, and watch the tiny little beings emerge from their individual eggs. Petra and Milan frequently went with Karel to school during the weekends to make sure the chicks were maturing properly in the eggs. They adjusted the incubator temperature and that sort of thing. During this time, Zora came into the world and she is now home. Petra and Milan love to hold her. Coincidentally, the chicks hatched this week. Below, see the photo of Milan and Petra reacting to the brood of chicks that have made their startling appearance in Karel’s lab. Notice Milan’s facial expression. Verdella decides to take Marne (about 8) and Lisa (about 5) with her to see the OB/GYN in Lincoln. After the visit, the three of them will do something fun in the big city. When they arrive at the doctor’s office, the children, who are all dressed up, sit quietly in the waiting room paging through books for children as Verdella sees the doctor. An ultrasound quickly shows why Verdella is not feeling well and has gained a little weight. She is pregnant with our son Keller. Verdella is stunned and surprised. We had no plans to have a third child. Collecting herself, she walks into the waiting room and sits down with the children. The shock shows on her face. Marne asks her mom what is wrong. Verdella says she is “pregnant.” Marne asks Verdella to tell her what “pregnant” means. Verdella patiently explains and includes a passing reference to the “egg.” Lisa is silent. Both children seem perfectly satisfied with Verdella’s explanation and off everyone goes to the car. As they are walking to the car, little Lisa asks Marne: “Is Mom going to have a chicken?” Marne looks down, and sternly informs Lisa, “If Mom has a chicken, we’ll love it anyway.” At that point, Verdella burst out laughing and crying at the same time.